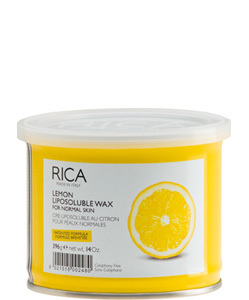 Renowned for its natural antiseptic healing and purifying properties, natural essential oil of lemon is used in this Rica wax to promote rapid recovery of the skin after depilation. Renowned for its natural antiseptic healing, purifying and antioxidant properties to promote rapid recovery of the skin after depilation. A fresh fragrance to delight your senses during depilation. Lemon Wax reduces redness and is exceptionally soothing and protective for the skin after depilation.